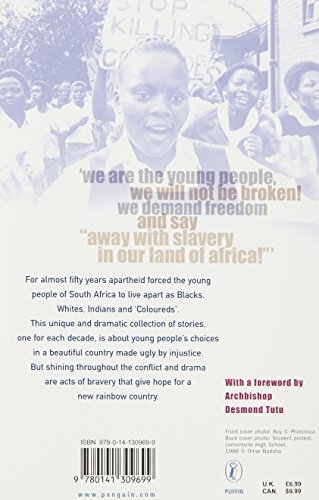 This collection of stories about South Africa contains one for each of the last seven decades of the twentieth century. This is an absorbing and varied collection, given added poignancy by the historical timeline at the end, relating actual events to the actions and attitudes in individual tales. The tales are deceptively simple and seem to be about mundane lives, but the conscience of an entire nation lies below the surface, waiting for young readers to explore and consider what the apartheid regime actually meant to ordinary folk of whatever colour. Good for sharing, this book will make a thought-provoking read for any classroom and a good extension to Naidoo's Journey to Jo'burg.